NITTO KOHKI pumps feature a unique, patent-awarded linear-motor-driven free piston system that is globally proven in the wastewater treatment and aquaculture industries. 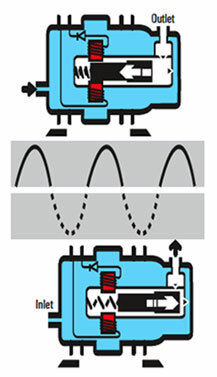 This unique design theory eliminates the wear components typically found in conventional air compressors and vacuum pumps, such as crank shafts, connecting rods and ball bearings. The only moving part is the piston! Also eliminated is the need for any lubrication. Fewer parts translate into fewer problems. Easy Maintenance Providing maintenance on the pump is relatively easy with a completely oil-less design and no need for additional lubrication. Along with changing the filter as required, the only component to replace in the pump afte an extensive operating period is the piston.